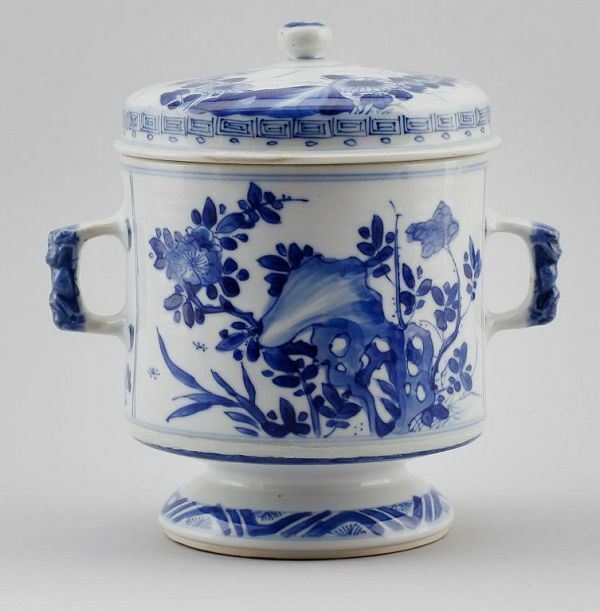 Caudle cup, Chinese export porcelain, Kangxi period 18662-1722, ca 1700. Lidded bowl, sometimes on a foot. For serving of caudle to convalescents, also for initiation ceremonies. A caudle is a British thickened and sweetened alcoholic hot drink, somewhat like eggnog. It was popular in the Middle Ages for its supposed medicinal properties. The word caudle came into Middle English via the Old North French word caudel, ultimately derived from Latin caldus, meaning 'warm'. The earliest surviving recipe, from 1300–1325, is simply a list of ingredients: wine, wheat starch, raisins, and sugar to "abate the strength of the wine". In a description of an initiation ceremony at Merton College, Oxford in 1647, caudle is described as a "syrupy gruel with spices and wine or ale added.